Netherlands emissions ruling: Court orders Dutch government to reduce carbon emissions further in next five years. 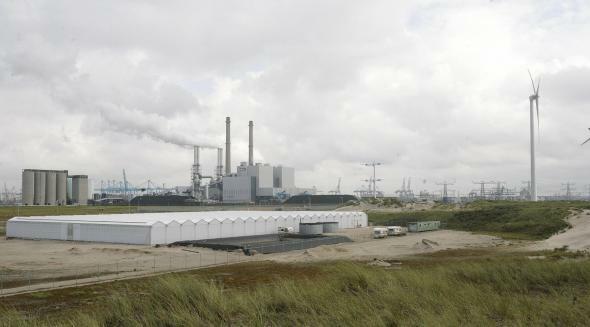 This electricity plant in the Dutch city of Rotterdam is surrounded by the Happy Shrimp farm, which makes use of the plant’s residual heat to raise tropical shrimp. The Hague District Court made the ruling in a case brought by a sustainability organization on behalf of some 900 citizens, claiming that the government has a duty of care to protect its people against looming dangers, including the effects of climate change on this low-lying country. With half of the country’s landmass below or less than a meter above sea level, the threat of rising water is far from abstract for residents of the Netherlands. The Dutch must maintain a complex system of flood-control structures to stay dry, and the protection of developed land will become more difficult and costly if ocean levels continue to rise. [T]he costs of the measures ordered by the court are not unacceptably high. Therefore, the State should not hide behind the argument that the solution to the global climate problem does not depend solely on Dutch efforts. Any reduction of emissions contributes to the prevention of dangerous climate change and as a developed country the Netherlands should take the lead in this. Here in the United States, where parts of our government are still arguing over whether the rising oceans are due to man-made emissions, the courts have sometimes been helpful in getting the attention of public agencies. In Massachusetts v. Environmental Protection Agency (2007), the U.S. Supreme Court sided with 12 states, three cities, and a host of environmental groups in a 5-4 ruling that the EPA was failing in its primary mission by refusing to regulate automotive greenhouse gas emissions. The ruling led the EPA to recognize that greenhouse-gas tailpipe pollution could “endanger public health or welfare” via climate change and to issue emissions standards for new-car manufacturers.